I like cooking, and enjoy cooking for my husband and my two kids every day. I prefer to cook from scratch as I can control what I put in there and adjust the recipe. At the same time, I need time to play with my kids, so I like to have some time-saving tricks like using thermas pot to cook. I got plain one because that's what I usually eat. (And because I was feeling guilty for eating some Halloween candies left over.. :P) It was creamy and smooth, and I find that it's runnier type of yogurt. There was a layer of thicker texture on the top in every one of them. To be honest, I would prefer the thicker part texture better, but smooth thinner texture was still likable for me. Our kids (8 years old and 5 years old) tried with a drizzle of maple syrup, and they liked it too. We usually make our yogurt from milk, but I would buy this when home-made yogurt is not ready yet. Probiotic culture is not added to yogurt at home, so this is something beneficial for us too. I can trust this product as it's made of recognizable ingredients and no weird things are added. I can recommend this to friends with confidence because it's just simply real (probiotic) yogurt! I and my kids were so excited to try it out! 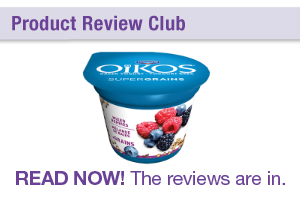 Among three of us, we had a little varied opinion on OIKOS SuperGrains Greek Yogurt. - Taste and texture The taste was sweeter Greek yogurt with fruit sauce. It's not as thick or creamy like some other Greek yogurt, but compared to regular yogurt it's thicker and more creamy. It was smooth until I put the sauce part into my mouth. I think it was buckwheat that gave me "hmmm?" feeling while I was eating. You can notice chia seeds and quinoa too, but sizewise buckwheat was a lot more noticeable, but not crunchy or anything. I would have liked better if buckwheat is made into something crunchy or only chia seeds and quinoa are used for in this smooth yogurt. My 7 year old was not a big fan of buckwheat texture that much either. - Woud I buy? I don't think I buy this... If I'm looking for something sweet for dessert it might be good. Also between the kids, one liked but the other one didn't like. -Would I recommend to other people? Yes, especially as a snack on the go or busy morning. I cannot be sure, but thanks to the grains, it will be more filling than regular yogurt. (I find it more filling when I add chia seeds to oatmeal or to yogurt.) -Overall thoughts as for healthy eating It will be a good replacement for healthier snack. It contains protein, but it's not much higher than other greek yogurt. Quinoa, chia seeds, and buckwheat are great extra for nutritional value, however, I don't think there are that much in a package to make a huge nutritional difference. -Star rating Among my family members, it was 4 out of 5, and personally, it's 3 out of 5. I tried a strawberry one, and it was okay. The texture was creamy and rich. I still consider it as "dessert yogurt" because it was sweeter than I want to have for everyday. Nuts and fruits are good addition to have, but I would add nuts and fruits on my own into greek yogurt. The price seems to be quite expensive (it was $4.29) for that 2 individual portions. So I would prefer to buy a big tub of greek yogurt and add my own nuts and fruits. If you're on the go, it might be a healthy alternative and convenient. I was so curious about T-fal Actifry, too! Now that having read your review, I don't have the craving to get to know/want it anymore for the Mother's day. :P My biggest question was if you can deep fry stickier things like tempura. From what you wrote, it stirs with the paddle, so I don't think you can cook tempura... It was very helpful review to me. Thanks for the post! I was going to add Truvia to baking, but I was not sure how much I should substitute for sugar. So I used one in a cup of coffee. (I usually drink coffee and tea black, but I wanted to try Truvia somehow.) And I used the other for a mug cake I was making with microwave. The time I used for a mug cake, I could tell a difference from sugar, but it wasn't too bad. However, in a coffee, it was quite obvious. The bitter after taste was something I cannot enjoy. Compared to other artificial sweetener, I might choose Truvia if I had to choose one. But because nobody in my household is diabetic, I prefer to use regular sweetener such as maple syrup, honey, sugar etc. I had heard of chia seeds, but this was my first try to eat them. Surprisingly, they were not too nutty, crunchy and so nutritious! So far I've used them for the home made bread, yogurt, oat meal, and on top of the salad. I haven't tried them soaking in the water to get jelly texture, but I would like to try it sometime soon. It's hard to say what they taste like...not really that much tastes on its own. To me, they're like crunchy poppy seeds. I would definitely use it again as I like the texture and the nutritional value. Also it is easy to use as I do not have to grind them. From a point view of healthy eating, they are great addition of omega-3 to diets. Also, they are high in fiber and in protein, which is awesome. The best part is that I don't have to grind them, simply I can sprinkle on top of something. So I give it 5 stars! And I'm gonna tell other friends about this as I really like it! I had tried flax seeds before, but either I ground myself or I bought ground flax seeds. This Omega Crunch flax topping came with 4 flavours, and you could enjoy the convenience of just sprinkling. As they came with different flavours, I used them in different ways. I put sweet cinnamon on my yogurt, but I couldn't really taste them sweet with yogurt as the taste is not strong. I could smell and taste cinnamon, but that's it. I used roasted maple on oatmeal because I like sometimes sweet oatmeal. But again, I couldn't quite tell the taste difference. I sprinkled roasted garlic on top of a garden salad, which was stronger garlic flavour than I had expected when I tried it on its own by accident while preparation. And I used regular flax on top in waffles. Maybe because all of the things I used for contains quite water/humidity, I couldn't experience "crunch" as I had expected. I mean, I could get the shell texture, but it wasn't "crunch." It was in the name of the product, so I was anticipating more of crunch texture from it. All of the taste were subtle, so it can be used for various ways easily. From a healthy eating aspect, this will be a great addition of Omega-3 to your diet without hustle. But I would grind flax seeds on my own and I will be okay with it. I'm not sure if flax seeds will be oxidized after a while, and I wouldn't mind grinding instead of paying extra. To me, it tasted like blanched almonds with nutty flavour. So I used them as I use almonds, like on the salad, on top of the bread, etc. Nutritionally, it sounds great! Even from the comparison with other healthier seed products, higher in protein, Omega 3 & 6, and lower in carb. Also unlike flax seeds, it doesn't have to be ground to release the beneficial ingredients. I would use it again for sure. But if I didn't have this opportunity, I wouldn't have even tried it. I didn't know what exactly "hemp" was until I looked it up the closest translation on the Internet. (I'm not native in English.) I had read that it's not a drug on this page, but the translation was something I didn't feel comfortable eating. Aside from this confusion, I rate this product 5 stars as it's very nutritious and easy to use. 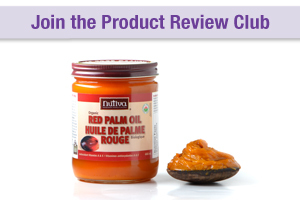 I had read of the review of the red palm oil here, but it was my first time to try it. As soon as I received the product, I tried it as it is a little bit. The taste reminded me of avocados a little bit. The smell was almost none. I used it as a part of dressing and in hummus. It doesn't have strong flavour like coconut oil or olive oil, so it is easier to use in various ways. But, as it says "medium-heat cooking" for cooking suggestion, I just assumed that it will not be good for high-heat cooking like stir fry. So I haven't used it for stir fry yet. Also, I was a little hesitant to use it because of the colour as we have a little one who likes eating with fingers, which means there is a big possibility of a big mess. But in the end, it was not as bad as I had expected. It says it's high in Vitamin A and E, which is great. But it is not that much appealing to me to get those nutrition from red palm oil because they are not hard to get from all other sorts of daily food. It will be a good addition in nutrition wise, but I would prefer to keep using canola oil, extra virgin olive oil, and some coconut oil as they can be used in various occasions with unique flavour. Especially with the price range of $10 to $15 for that size, I'm okay with what I'm using now. I don't find it that great nor that bad, so I rate 3 stars. Thank you for letting us (my daughter and me) try this product! We loved it!! We eat regular dried fruits, but had never tried freeze dried fruits. When I saw them, they reminded me of baby rice snacks (the oval shaped, puffy, light texture ones). They tasted so much ... pear! They were so sweet, but like just fruits pears, it didn't leave any aftertaste. I felt like they are a lot sweeter than fruits pears. They were so light, and the texture reminded me of the baby rice snacks as well. One of the best part of this product is that nothing was stuck between my teeth! Unlike regular dried fruits, they don't stick to teeth at all. They are not as hard as baked fruits, so nothing is left in molars after eating. I can share this with my children without worrying about brushing teeth right after snack time, which will be perfect snack inside and outside! Also, another part I loved about this product is that they are 100% pears, nothing added. It is quite hard to find dried fruits which are nothing added. I spent so long time to read labels of the dried fruits products. This is something I can serve with confidence, without any worry! I strongly recommend this product to everyone. And I would buy it next time, for sure! I rate 5 stars because we loved the taste, texture, and the fact nothing added! Again, thank you for this trying opportunity. It was quite an eye-opening tasting time for me. This was my second time experience with gluten free pasta. (The first time was when my friend prepared, and I was not a big fan of it... they were a lot harder than I preferred, not "al dente", just hard.) I tried eating as they were as soon as after I cooked, and used them for the pasta salad. To me, it tasted more like white rice rather than pasta maybe because it's made with white rice. Even when mixed with olive oil, some spices, and Parmesan cheese, we could tell that it was different from the regular wheat pasta. They were more "plain" taste and they didn't have any nutty flavour at all. As for the texture, I was not a big fan of it at all as they fall apart easily. Because I don't like over-cooked pasta, I was being careful with cooking. But it turned out softer than regular pasta and they fall apart very easily. I don't know if it's normal as gluten free pasta, but I have noticed that there were tiny cracks all over the pasta and I could chew them before cooking, which will lead to falling apart more easily than regular pasta. This was my first try to cook gluten free pasta, and maybe I should have cooked a lot shorter time. For the people who are avoiding gluten and who don't like nutty flavour, I think this product will be good. However, for the people who don't need to avoid gluten, I would not recommend and I wouldn't buy it for myself, either.